The ideal fitness experience is fun, calming and convenient. At least, that’s what the Nielsen Global Consumer Exercise Trends Survey 2014 reports. But for many Americans, exercise facilities are not convenient. Only about one in five homes have parks within a half-mile, and about the same number have a fitness or recreation center within that distance. And the farther a fitness facility is, the less likely you are to workout. The difference of a mile — a four-mile commute versus a five-mile commute — can mean exercising five times a month or one. A swim spa from Master Spas brings the gym or pool to the convenience of your backyard, changing the commute from miles to steps. And the workouts are fun while the therapy side offers a calming retreat. 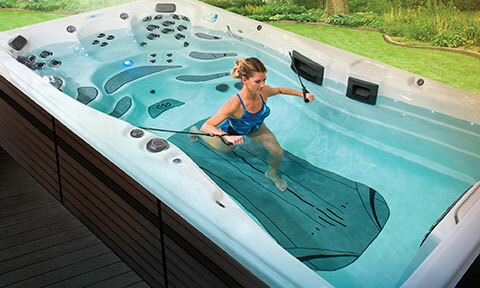 Swim spas from Master Spas include the H2Xercise Fitness System. Accessories include resistance bands and rowing bars. Rates of inactivity continue to grow among members of Generation X, according to the Physical Activity Council. Why? Time constraints. The 2019 participation report shows that 28.1% of Gen Xers are inactive, second only to Boomers for inactivity. About a third of Boomers are inactive. It can be a challenge to get to the gym or the pool. Commuters will spend time getting to the facility, more time to find a parking spot and then getting ready in a locker room — all of which adds up. And that doesn’t even factor in that you have to do that in the hours set by the fitness facility. A swim spa is just steps away, whether it’s installed in your backyard or inside. Instead of looking for a parking space, you find a quick spot to place your towel. Instead of opening locker after locker trying to find one not in use, your belongings are always safe at home. Swim spa users can fit in a quick exercise session when there’s an opening in their schedule — whether it’s before work or in the evening after the kids’ sports practices. Pool Closed? Not With a Swim Spa. Lap swim. Recreational swim. Water walk. One lap lane available. Closed for the season. Swimmers are all too familiar with those phrases. It can be frustrating to arrive at a fitness center ready for a workout only to find a sign posted or discover the door is locked. Sometimes you can plan around the facility’s schedule — group class in the pool, swim lessons or lengthy maintenance. But, at other times, you can be left to find an alternative with little notice. And when you have your own schedule to manage, chances are that a second commute make it near impossible. With a swim spa, the water is ready when you are. Water walking? It’s open whenever you find time in your schedule. Just one lane? No problem. The lane is always reserved for you. And closed for the season? Not with a swim spa. Swim spas from Master Spas are made with environmentally friendly foam insulation that keeps the heat in — no matter the weather. With the ability to adjust the temperature, too, the water is always perfect to you, for you. Year-round. A swim spa is the perfect at home gym. Sure, you can swim but you can also do a strength workout. Regular exercise helps us to feel better and lead a healthier lifestyle. And many of us are familiar with the recommendation that adults should get at least 150 minutes of moderate intensity aerobic exercise each week. But the guidelines also suggest that adults get in strengthening exercises two times a week. If you are hitting up a fitness center, adding in a resistance workout means getting out of the pool, drying off and changing into new clothes before hitting up the weight area. In a swim spa, users benefit from the natural resistance of water — which is about 12 times that of air. Exercisers can begin with leg exercises — raises, extensions and hamstring curls — or make things more challenging with the dumbbells and fins included in the H2Xercise Fitness System. The fitness system, which comes with every Master Spas Swim Spa, also includes rowing bars and resistance bands, which complement and enhance a strength routine. They simply clip on to the swim spa. And the comprehensive guide offers programs or ideas to mix up your routine. Most everyone enjoys relaxing after a good workout. And for those in serious training, recovery is just as important as the workouts. But when it’s already a challenge to fit them in, recovery and massage can be the first things to be eliminated. With a swim spa from Master Spas, recovery becomes something to fit in to something that is not only convenient but fun. The swim spas feature contoured seating with therapy jets, which deliver a custom massage. Whether you need a gentle approach or muscle-kneading force, a swim spa can ease muscle aches and tension while your mind relaxes. What gym can do that?